I haven’t done any fiber since Friday, although I have some handwork to keep me busy tonight. I rode the big red horse yesterday, and we went hammering off through the snow and mud under the power lines. She was great, and gave herself a great roll in the sand and mud on our return. Today I went with my visiting-from-Philadelphia to the Sacred Harp Singing in the top of the big yellow school. There were more than 300 people in a square facing into the center, singing these amazing songs. The goal is full volume, full tempo for the duration – the result is an astounding noise. I could hear them on the third floor as I came in the front door at ground level. When I got home around lunch, Alice requested a tandem ride, and since I like to encourage that kind of request I complied almost instantly. 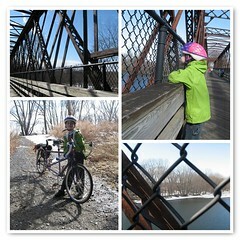 We tootled around our neighborhood, under a bridge, along the bike path over the river, and along home again. We were singing songs as loud as possible. A different effect from the morning, but some of the same spirit of joy in both.